Yeah. I have been getting a lot of email notifications from WordPress for comments moderation and comments from my readers. At first, I am very excited and happy to receive emails from WordPress to notify me that my readers had commented in my blog posts. After a while, as my comments are getting more, so does my emails in my email inbox. 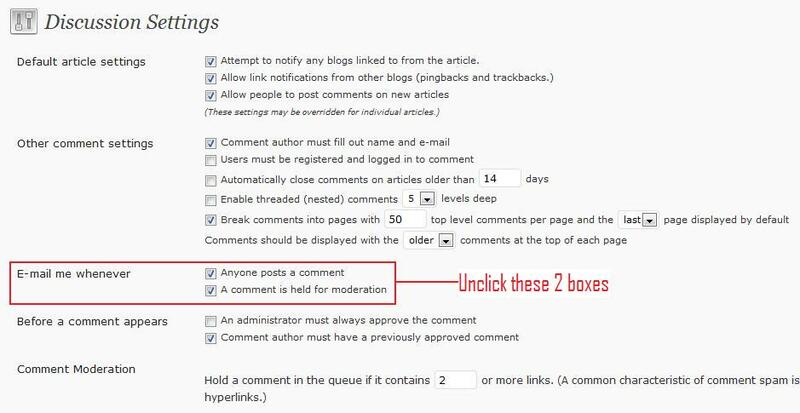 Email notifications from WordPress for comments in my blog. I am getting frustrated because I need to delete the emails every time there are comments in my blog. I mean, I can see that I have comments in my WordPress dashboard and I don’t really need WordPress to email me to notify me, right? I tried to solve it but I tried the easier way. I googled it. Actually, it’s very simple. Just go to the Settings and look for Discussion. That’s solves my problem and I hope it helps you too. Yet Another Related Posts Plugin (YARPP) is BETTER than LinkWithin Plugin! I’d also been getting lots of emails daily on my few wordpress sites and I often lost my important emails due to this, and they took lot of space in my inbox and deleting them daily wasn’t a good work for me… and I googled and found this plugin… I hope you guys will surely like this. Thanks for dropping by my blog and thanks for the info. 🙂 Will look into it. Next story iPhone 5 June 2011 Launch will be delayed to October 2011? Previous story Apple Store Online Ordering for iPad 2 is available for Australia & New Zealand!! !